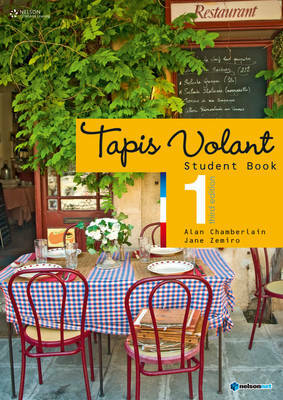 The Tapis Volant series is a market-leading French teaching and learning resource that has been so successful it is now in its third edition! The secret of its success is very simple: its straightforward teaching methodology and clear pedagogy make it flexible, adaptable and yet relevant to any classroom requirement. The third edition comes with several linguistic and cultural updates, and interweaves an intercultural language learning approach with a focus on communication and linguistic reflection. The language units are structured as follows: Situation(s): new cartoon dialogues Faons de dire: colourful, lively spread showcasing the main communicative expressions relating to the themes of the unit Activits orales: language tasks with additional assistance given via selected blackline masters Outils langue: grammar, phonetics and language models; notes in English with French headings Espace culture: interesting facts and figures, maps, photos and information, with intercultural reflection and student-oriented work Lecture: varied and modern texts for guided reading practice T ches pratiques: summative tasks where students can work independently or in teams to create role plays and scenarios. The Student Book is supported by a Workbook, Teacher Resource Pack and Audio CDs. NEW! iPhone and iPod app is downloadable from iTunes, and it's a fun modern way to revise core French vocabulary! *Complimentary access to NelsonNet is available to teachers who use the accompanying student book and workbook as a core resource in their classroom. Contact your education consultant for access codes and conditions.